20 North Gallery salutes the memory of a dear friend—and an arts innovator of international impact—Dan Robbins, who passed away on April 1, 2019. On March 24, 2018, 20 North Gallery was honored to welcome Dan Robbins, creator of the worldwide popular culture phenomenon Paint By Number, to present what turned out to be his last public talk, marking the conclusion of a commemorative exhibit of Paint By Number canvases collected by 20 North Gallery Art Director Emerita Peggy Grant and her late friend Ann Goodridge. During his engaging and entertaining presentation, Robbins’ roguish charm and self-effacing humor belied his status as game-changer of monumental scale in the art world, in forever altering America’s definition of “Art.” His incredibly accessible (and, yes, often downright kitschy) Paint By Number concept made it possible for anyone and everyone to be a part of—and have an opinion about—what it means to be an artist. On a more personal level, Dan was a dear friend of Peggy Grant. He hired her as a Paint By Number designer in 1952, launching her lifelong professional career in the arts. At Craft Master, she met her husband, the late Adam Grant who was Robbins’ first hire. The newly married Grants, as well as the Robbins family, moved to Toledo in 1955, when the company was sold to the Donofrio family. Many years later , Peggy became the art director for 20 North and often enjoyed welcoming her old friend Dan Robbins to exhibit and speak about Paint By Number history. When she learned of Robbin’s death, Peggy Grant said, “I have so much to thank him for.” As I write this, my attention is drawn to his obituary notices flooding my search bar—from New York to Los Angeles, London to Hong Kong—and I think, “Indeed, Peggy, we all do.” Thank you, Dan. Often described as “the most exhibited artist in the world,” Dan Robbins was the original designer of the Paint By Number concept that quickly became a cultural phenomenon in America—and made it possible ‘to make anyone an “artist.”’ Even more than sixty-five years after first launching the brand, canvases of his design still proudly hang on the walls of homes throughout the nation. Employed by the Palmer Paint Company in Detroit (Michigan) as a freelance commercial artist, Robbins based his concept on Leonardo da Vinci’s practice of numbering sections of his canvases for apprentices to complete. After trial and error, Robbins’ painting kits became arguably the most beloved—and most maligned—hobby of the “new leisure class” of 1950s Americans. Upon the meteoric success of the brand, Robbins hired additional designers and moved into the position of head of art direction and marketing for Palmer Paints and, later, the Craft Master company of Toledo (Ohio). Dan Robbins with his favorite Paint By Number design, “Old Mill Stream,” painted by his mother. 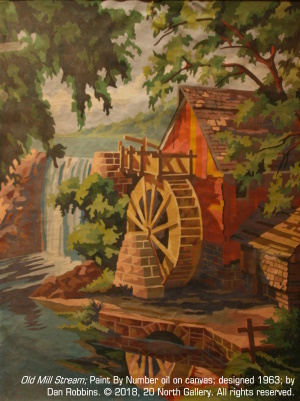 After two decades of designing and marketing paintings that promoted “the art of leisure,” Robbins moved to Illinois to head his own Chicago-area advertising agency and became the definitive expert of the Paint By Number genre, spending many years lecturing, researching and archiving Paint By Number history. He was a consultant to the 2001 Smithsonian’s National Museum of American History exhibition, Paint By Number: Accounting for Taste in the 1950s and the author of What Ever Happened To Paint-By-Numbers? A humorous personal account of what it took to make anyone an “artist” (available for sale through 20 North Gallery). 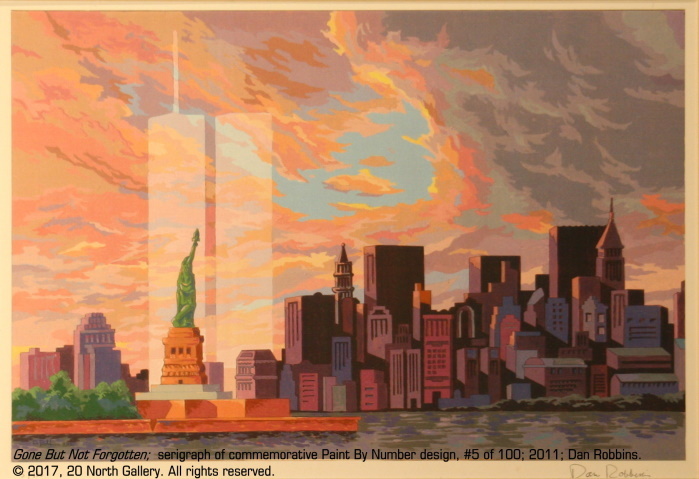 In 2011, to commemorate the 60th anniversary of Paint By Number, Robbins collaborated with Palmer Paint Products and the non-profit service organization Voices of September 11th to create a Paint By Number kit, titled Gone But Not Forgotten, depicting the New York City skyline with a silhouetted view of the Twin Towers (included in the Peggy Grant Collection). This release marked the fulfillment of a personal vow. The subject matter had been previously painted by Robbins, with the skyline intact, as a frontispiece for the Smithsonian exhibit catalogue in 2001, with plans to release a coordinating kit to be sold through the Smithsonian. By the end of that year, this plan was no longer possible and Robbins hoped that, someday, he would be able to employ that design to honor the fallen. In 2013, Robbin’s personal Paint By Number archives and original canvases were accepted in the permanent display of the Detroit Historical Museum, as one of the 50 greatest innovators in the history of Michigan, exhibited just down the hall from Henry Ford. Upon his retirement, Robbins and his wife Estelle, the first Craft Master proofer, returned to Toledo (Ohio). There, Dan Robbins passed away on April 1, 2019. For a complete biography, as well as essays and personal sketches celebrating the history of the Paint By Number phenomenon, please visit the Dan Robbin Room of the virtual Paint By Number Museum. The cultural phenomenon of Paint By Number began in 1950 at the Palmer Paint Company, owned by Max Klein, in Detroit (Michigan). Free-lancing commercial artist Dan Robbins was given the task of devising a hobby kit that would promote the sale of Klein’s paint products. Robbins based his concept on Leonardo da Vinci’s practice of numbering sections of his canvases for apprentices to complete. After trial and error, Robbins’ painting kits became arguably the most loved—and most vilified—hobby of the “new leisure class” of 1950s Americans. As the business rapidly expanded, Robbins hired additional designers, including Adam Grant and Margaret “Peggy” Brennan, whose artistic partnership soon evolved to marriage. Robbins became their good friend, as well as the head of art direction and marketing for Palmer Paint and, later, the Craft Master company of Toledo (Ohio). It is important to note that Palmer Paint was not the first company to produce a numbered painting kit. 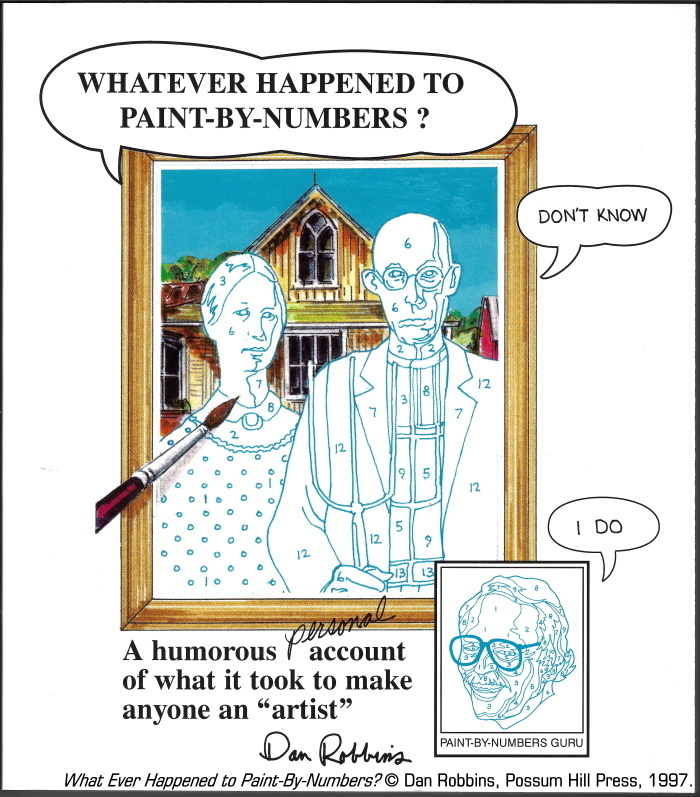 In his book, Whatever Happened To Paint By Numbers?, Dan Robbins relates his chagrin in discovering that a U.S. patent for that concept was filed in 1923. But although Palmer Paint’s Craft Master brand was not the original producer of the concept, they were the originator of the industry, as well as the best—the most prolific, influential, highest selling and longest lived company in the genre. The company has experienced many permutations over the years, all of which can be classed as representing the original Paint By Number brand and have come to be colloquially referred to as “Craft Master.” From the beginning, Craft Master was developed as a separate name for Palmer Paint to distinguish the hobby aspect of the business from their more industrial projects. Later, they launched the off-shoot, Palmer Pann (Pann Products, Paint-A-Number) as simplified, lower-cost versions of the kits. In 1956, Palmer Paint sold Palmer Pann to the Donofrio family in Toledo, who had served as the packaging manufacturers of the kits. The Donofrios then renamed the company Craft Master, headquartered in Toledo. In 1969, General Mills (Toledo, Ohio), seeking to enter the toy and hobby market with their “Fundimensions” line, purchased Craft Master from the Donofrios. Eventually, General Mills divested from their non-food lines while the Donofrios reentered the industry as Craft House in 1973, utilizing the original designs and printing plates still in their possession. In 2006, Chartpak (Massachusetts & Hong Kong) purchased the Craft House brand and moved the company’s production and headquarters away from Toledo. As of 2018, Chartpak is still selling Paint By Number kits under the “legacy brand” of Craft House. As the popular and commercial success of the Paint By Number kits grew in the early 1950s, numerous rival companies emerged. Among these competitors were Craftint (Cleveland, Ohio), Art Award (Brooklyn, New York & North Bergen, New Jersey), Testors (Rockford, Illinois) and Picture Craft (Decatur, Illinois), among many others. Of all of these, Craft Master remained the authoritative manufacturer of the genre, achieving iconic status. Their trade name “Paint By Number” has become the definitive moniker of the industry, eclipsing the more accurate terminology of “numbered painting kit,” much as “Kleenex” and “Photoshop” have defined the industries of their own respective products. Through the variety, complexity and aesthetic quality of their compositions, their competitive and accessible pricing, their success in marketing that provided the public a sense of meaningful purpose to recreation, not to mention the sheer quantity of kits they made available, numbering in scores upon scores of millions, Craft Master undeniably became the superlative brand. The result of this has had vast, highly controversial and far reaching effects on American culture and even the concept of the meaning of “Art.” At a time when only large cosmopolitan regions had art supply stores, Paint By Number kits were sold at toy stores, department stores and drugstores, making the tools of fine art accessible to the general population for the first time in American history. But, simultaneously, the Paint By Number craze was criticized to the point of vilification for debasing the concept of fine art and oversimplifying the creative process for the purpose of creating regimented facsimiles of original work. The controversy achieved greater notoriety in California’s San Francisco Bay area, when a completed canvas of Dan Robbins’ design, Abstract No. 1, was entered into an amateur art competition in 1952 and won third prize. “Abstract No. 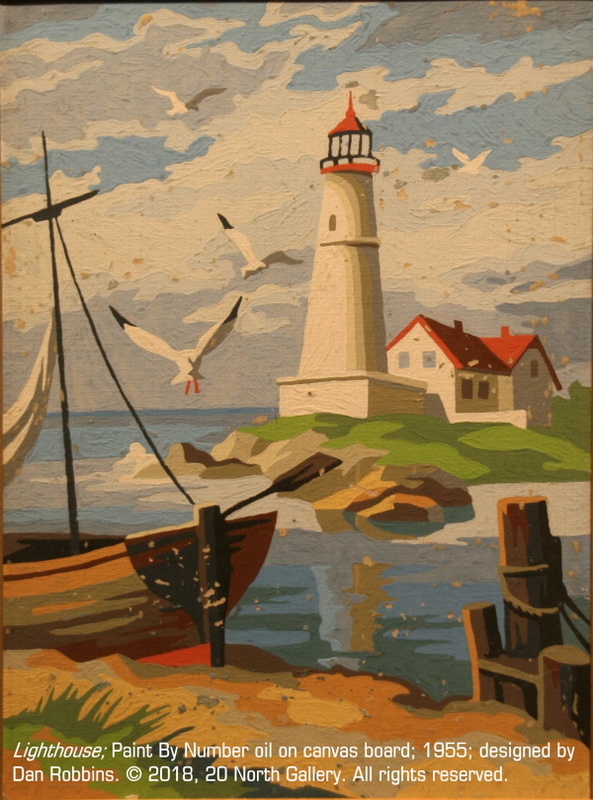 1,” the first Paint By Number, designed and painted by Dan Robbins in 1950. Image adapted from the collection archive of the virtual Paint By Number Museum. This incident is one of many that have made the inclusion of “no kit work” a standard caveat in prospectuses for today’s juried art exhibitions. And, in a compelling display of relevance to American creative culture, “no kit work” so often now refers not just to Paint By Number, but also to the use of adult coloring books, “wine & canvas” event subjects and filter apps like Prisma®, which fascinatingly transforms the users’ own digital photos into images in the style of such great artists as Monet, Van Gogh, Roy Lichtenstein and, someday perhaps, Paint By Number. Also relevant to the Paint By Number narrative are the countless gallerists and collectors who navigate reoccurring trends of “appropriation” in art…and Andy Warhol, that icon of iconic reproduction, who was a dedicated fan, collector and appropriator of Paint By Number canvases. 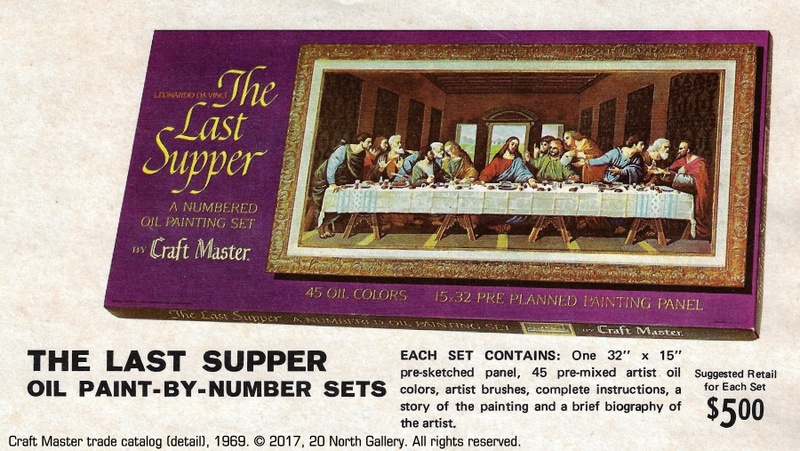 1969 Craft Master catalog detail, “The Last Supper” Paint By Number kit. From the archival collection of Peggy Grant. Peggy Grant is fond of recounting how, in her travels throughout the U.S. and Europe, she often found her husband Adam’s 1964 design of The Last Supper (after da Vinci) hanging in the homes of her hosts. Truly, how many people would hang a reproduction of a 15th century work of art in their home, if not for the pride it provided in being “painted” by them? This, and the combined testament of generations of patrons, has demonstrated that, by making the process of painting more accessible to everyday folk, “Art,” itself, became more approachable and no longer the sole province of the cultural elite. Paint By Number canvases have been proudly displayed in the homes of millions of people who possessed a new-found appreciation for the creative process. 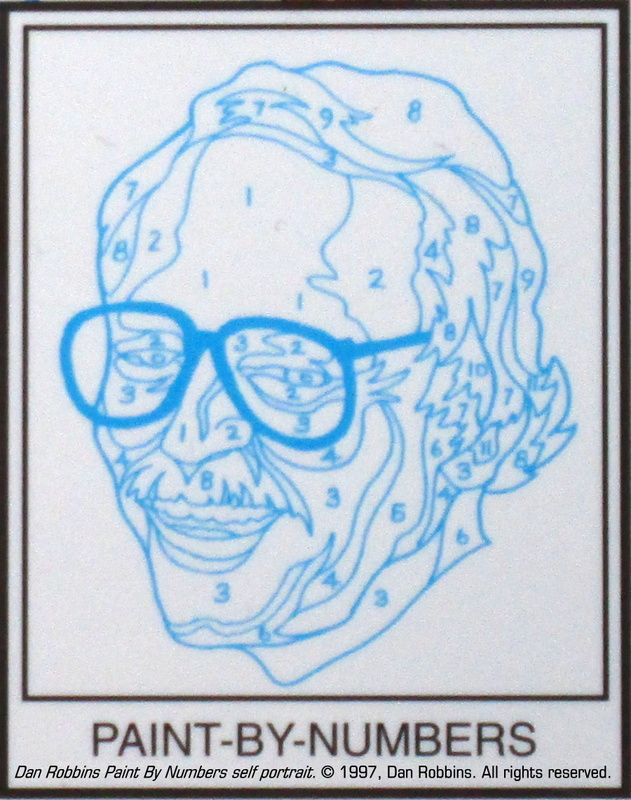 Many fans attest that, through the introduction of Paint By Number, they had the courage to later attempt their own original paintings, or that they had developed a greater consciousness and appreciation for fine art—proud accomplishments for Mr. Robbins and all of those who grew the Paint By Number brand. Signed copies of Dan Robbins’ memoir, Whatever Happened To Paint By Numbers? : a humorous personal account of what it took to make anyone an “artist,” remain available for sale at 20 North Gallery.